As the Firewire and USB2.0 drives start taking off, there are a lot of companies that are joining the market. Working on making hardware that supports both is one thing many are incorporating into their one stand alone drive. 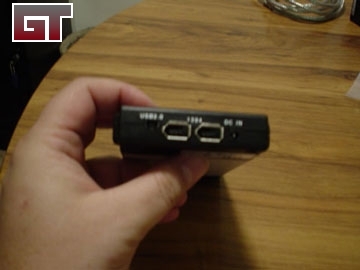 Today I have a Mini Portable Disk (MPD SI-2110) from Enhance Technology on the review block, lets see how it fairs. First off lets take a look at what was sent in the box. You get the drivers, instructions, one 6 foot FireWire cable (Clear with silver meshing), one USB 2.0 cable, the drive enclosure itself, and the power cable. 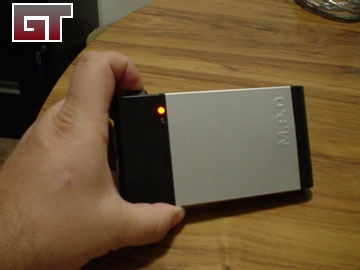 Please note, for this review they have included a 40GB drive so we can test out MPD's functions. 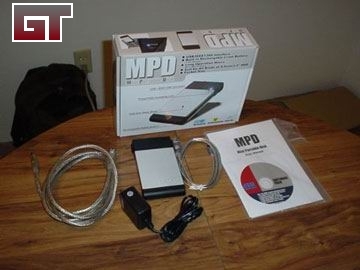 This MPD comes with a lithium-ion battery to power the disk without using the power from the FireWire cable. This helps a lot, especially when you are on the road. The power button is on the left side of the MIni Portable Disk. All of the plugs for the MPD are located on the back. You have one USB 2.0 and two FireWire ports so you can chain the 1394 devices together (400' MAX), plus the DC IN for power / re-charge.